This is a sensible move to make the city safer and more attractive for carbon-sparing, health-promoting bicycling, according to some. Unnecessary and disruptive and not wanted by most people, argue others. The debate over the Island Bay cycleway is important because the way we build our streets shapes how we live, and consequently determines the health and well-being of populations. But it is nothing new. The Island Bay story has unfolded previously in other places. In essence, this is a debate about the best use of a limited common resource. In Wellington and in many other cities the status quo is being challenged. The fundamental question is: how does the public road accommodate change? What a mundane, boring story, you might think. Dedicated lanes for cyclists are being installed along The Parade in Island Bay, Wellington. These run for about 1.6 km on each side of the road and are, mostly, separated physically from traffic. Car parking along The Parade has been re-arranged, and in some stretches shifted out from the kerb so bike lanes run between the footpath and designated parking spaces. But it isn’t mundane or boring. Construction hasn’t finished, but already “Island Bay is a suburb at war” according to the Dominion Post. Strong opinions of all kinds are expressed on television, social media and in the blogosphere. A local councillor wants the (unfinished) lanes dug up and taken away. The present Mayor of Wellington, a strong supporter of the cycle way, was heckled at the Island Bay Festival in February. There was no problem in the first place, say others. Or, it makes the situation worse argue those who question the competence of the design and construction. “This project is an unfair imposition on the majority of road users” probably sums up much of the opposition. Dig and there are darker currents. Cyclists don’t deserve special treatment is a common sub-text, and here are some of the reasons: there aren’t enough of them and there never will be given Wellington’s bad weather and steep hills; they behave badly; they don’t pay their share of transport costs; and they dress foolishly and are not serious road-users. There certainly are serious questions about the design of the bike lanes and how they will work. These include: what happens at intersections and other breaks in the protected lanes? How to avoid confusion due to the unusual features of the lanes (especially the car parks distant from the kerb, and the round-the-back bus stop bypasses)? And what are the risks at each end of The Parade, where the lanes finish? But what is most remarkable about this story for me is its familiarity. What is happening in Island Bay has taken place in other cities. The arguments fit, almost word for word, with those made elsewhere. 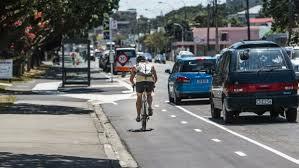 Check out what was written about bike lanes on Lake Road, on the North Shore of Auckland, for example. Overseas, New York City has made many changes to its streets but attempts to re-allocate space from cars to other road users have been fiercely resisted, on much the same grounds as in Island Bay. Jason Henderson has written an excellent book on the politics of mobility in San Francisco, in which the chapter on bicycle space in the city applies closely to the situation in Wellington. In London the push to grow cycling by re-building roads has had many successes, but there has been opposition. See, for example, the arguments made against Dutch style separated lanes in Enfield. The reason the Island Bay story is essentially a re-run of older controversies is this: there is a deep, underlying and terribly important issue here, and it has nothing to do with Island Bay (or any other specific location). The issue is how we, as a society, negotiate access to resources that are shared and limited. Roads are part of the public commons – they belong to everyone and they belong to no-one in particular. Everybody benefits from access, but concessions must be made because the resource is finite. Who concedes, and by how much, are matters that are vital to everyone’s welfare and must be agreed upon collectively. At present space and privilege on the public road are allocated predominantly to the private motor vehicle, but it hasn’t always been like this. There was no such thing as jaywalking in Lower Queen Street in Auckland in the early 1900s, for example. Today the forces for change are different. They include the growth of cities, congestion, air pollution, climate change, different kinds of new machines (electric bikes today, autonomous vehicles tomorrow) and the epidemics of diseases associated with physical inactivity and overweight. But once more there is a challenge to the status quo, and we are again faced with the question: how does the public road accommodate a new set of interests? According to James Longhurst, “it is a well-known story of imperfect allocation … through group decision making, with the added complication that mistakes might get someone run over, hobble an economy, or ruin the planet”. So what does all this mean for Island Bay? There must be a local solution, requiring hard work by Council and communities, stamina, good faith, political savvy and technical intelligence. But let’s not lose sight of the big picture, which is about how we, collectively, manage change. James Longhurst again: “the vehemence of the recurring battles since the bicycle’s arrival demonstrates that even the smallest alteration of perceptions, policy or physical construction may be perceived by competing forces as a new front in a war over a scarce resource”. 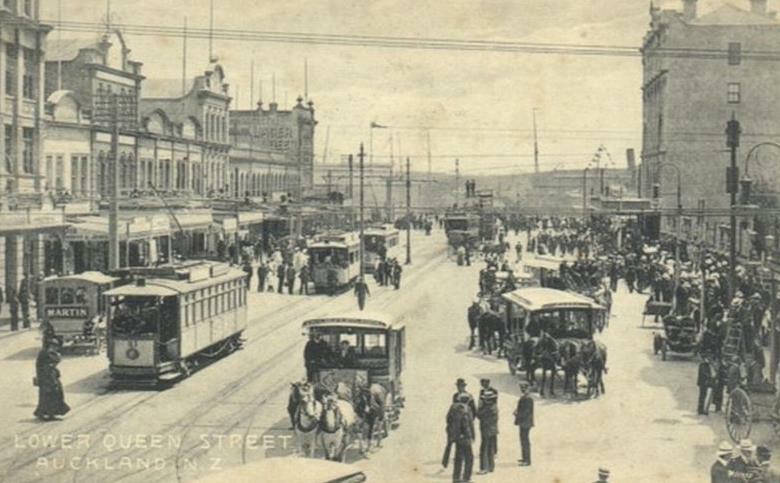 I argue that it is important to take a “responsiveness to change” perspective because the present New Zealand transport system is, in many respects, stiff, constrained, and not well equipped to manage challenges to the status quo. Here are three suggestions that are unlikely to resolve the Island Bay cycleway, but might contribute to sorting out future conflicts over what it really means to “share the road”. It would be a great help if governments signed up to a strategic vision and powerful targets for cycling and walking. There is nothing in New Zealand to match, just as an example, San Francisco’s vision of a 30/30/40 mode split by 2035 (30% motor vehicles, 30% transit, 40% walking and cycling). Many of those working in transport acknowledge the need for high-level goals to drive network change. Without this force from above, planning and operations fall back into incremental mode, and one of the consequences is that consultation tends to occur at the micro-scale. Change becomes very “sticky” and difficult to progress. We must overcome a systemic tendency towards conservatism in design. Arising perhaps from concerns over institutional and political risk, and focusing on mind-numbingly fine print, putting a brake on innovation and experimentation is dangerous because it increases the chance of system failure. It is difficult in New Zealand at present, for example, to apply New York-style soft interventions (such as the first, temporary barriers in Times Square) that are easy to install, can be assessed rapidly, and if need be, taken down rapidly. In this environment the best minds in the world may struggle to get the best value from existing infrastructure, scope new challenges, test unfamiliar solutions, and respond quickly. Finally, I argue for a greater investment in evaluation. Compared with the intense scrutiny that applies at the front end of planning (business cases, benefit cost ratios, trying to find the best way of navigating blizzards of consents), remarkably little effort goes into learning after the event. In terms of cycling infrastructure and safety for example, there is generally no follow-up until police crash statistics reveal a problem although it is well-known these data are insensitive, partial and slow to come to hand. Lack of follow-up also misses successes, which is important because re-allocation of road space may be a very good thing, benefiting residents, car drivers, walkers and cyclists, and local businesses. This entry was posted in Uncategorized and tagged Cycleway, Island Bay clycleway by Kate Sloane. Bookmark the permalink. Excellent blog Alistair. It deserves wide dissemination. Have you, for example, submitted it to the Dom Post? Robert – thanks for the positive feedback and encouragement. I will take up your suggestion and try my luck with the Dom Post, which has run a number of pieces on the cycle way. Excellent article Alistair. Thank you. It is sometimes good for people to read that what causes them such angst has been done before – and others have been through the same processes. It would be great if you can get this into the papers. It might give some sense of perspective that too many are lacking. Alister in your article may i quote “We must overcome a systemic tendency towards conservatism in design. Arising perhaps from concerns over institutional and political risk, and focusing on mind-numbingly fine print, putting a brake on innovation and experimentation is dangerous because it increases the chance of system failure” i find The Parade cycle way not very innovative plus not very safe. This very clearly shown by a video i posted on the wellington cycle aware site. I still feel the original proposal to have a two way lane on the western side would of been more community orientated and innovative. That option would of been more expensive so was dropped immediately. I feel the two way option would of had more community support. The existing system as seem in my video is completely unworkable and soon will have sections removed. Dear Peter – thanks for your comment. There are structural problems with the way that designs and plans are signed off, that was my point. In general, it is difficult to test new ideas due to the compliance and risk management issues. Of course it is appropriate to be cautious, to avoid causing harm. But alongside this there has to be readiness to go beyond business as usual, with due care, and to learn. At present the balance is too far towards the cautious end of the spectrum, in my view. There is a lot of work on two-way cycle lanes, because they do have some pluses, as you say. But I think the majority view is that the downsides outweigh the positives, in most instances. A common problem is taking cyclists from one side of the street to the other on entering and leaving the dedicated lanes. Also, the two-way design can be very confusing for motorists and pedestrians, especially at intersections and driveways. This is a cogent and balanced piece. I agree that the cycleway is a stepping stone – it needs to be seen as a first (faltering) step. I regularly ride my bike on the cycleway and despite its faults I feel relieved to be separated from car traffic, even for a short period. I also regularly drive my car along the Parade and my driving experience there is undiminished. Sure, I drive a bit slower and more carefully in the narrow carriageway but in my opinion driving in a slower and more careful fashion is a good thing for our community.